Sorry... the 2017 Lexus IS 350 is no longer being sold as new. 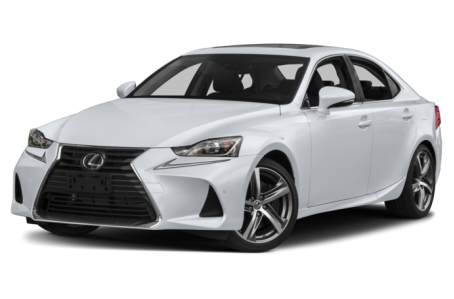 Instead, take the first step to a great deal on 2018 Lexus IS 350 with a free price quote! The latest IS enters its fourth model year with carryover drivetrains but a number of styling tweaks that aim to keep things fresh against a host of luxury sport sedans from Europe, Detroit and Japan. The revised sedan wears updated headlights, which sport a flatter appearance than last year's wavier design. Below them, the bumper forms a single piece with large new vertical air intakes instead of the layered horizontal intakes that characterized the 2014-2016 IS. Lexus' hourglass-shaped "spindle" grille narrows a little higher than it did before, with new horizontal inserts top to bottom. Around back, Lexus rejiggered the taillight reflectors and reshaped the tailpipes, but the overall look carries over. As before, the IS will offer an F-Sport version with more-aggressive styling, including a mesh grille with functional brake ducts around the lower sides, plus matching dark garnishes on the vertical air intakes that flank them. Changes inside are relatively minor. The IS' multimedia screen grows to 10.3 inches from its previous 7 inches. Lexus' available Remote Touch Interface, a knob-based controller on the center console, gets some new buttons to aid usability. Ahead of it, the climate and stereo controls are a little more sunken now to fit between the IS' knee bolsters. Updated for the 2016 model year, the IS' engines carry over for 2017. The IS 200t gets a 241-horsepower, turbocharged 2.0-liter four-cylinder, while the IS 300 and IS 350 have a 3.5-liter V-6 that makes 255 hp (IS 300) or 306 hp (IS 350). Rear-wheel drive is standard on the IS 200t and IS 350. All-wheel drive is unavailable on the IS 200t, standard on the IS 300 and optional on the IS 350. Rear-drive cars employ an eight-speed automatic transmission, while all-wheel-drive models have a six-speed automatic. The IS will get Lexus' Safety System Plus as standard equipment. That includes a forward collision warning system with automatic emergency braking, as well as a lane departure warning system with steering assist, adaptive cruise control and automatic high-beam headlights.